Born in Poland, Jachym moved to the United States with his family when he was five. He graduated from Francis T Maloney High School after being named a 1991 First Team High School All American soccer player. He then attended University of Hartford where he was a 1996 Second Team All American soccer player. Jachym played five seasons with the Hawks, losing his junior season to injury. As a result, he graduated with a bachelor's degree in marketing in 1996 and a master's degree in finance in 1997. In 2004, Hartford inducted Jachym into its Athletic Hall of Fame. In January 1997, the Harrisburg Heat of the National Professional Soccer League drafted Jachym and he was also offered a trial with Polish club Legia Warszawa. In February 1997, the Columbus Crew selected Jachym in the first round (third overall) of the 1997 MLS College Draft and Jachym signed with them. He played two games for the Crew then went on loan to the Milwaukee Rampage of the USISL A-League in May. The Crew recalled him, played him in one game, then released him at the end of May. Two weeks later, he signed with the New England Revolution. He played several games for the Revolution, interspersed with loans to lower division teams. On June 20, 1997, the Revolution sent Jachym on loan with the Worcester Wildfire. A week later, he was with the Connecticut Wolves. In 1998, the Revolution moved Jachym from forward to defender. 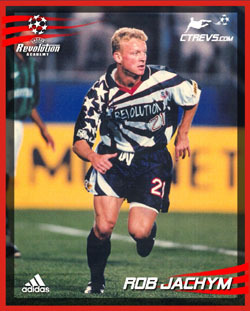 The Revolution continued to send Jachym on loan to lower division teams before waiving him on May 29, 1998. He then signed with the Worcester Wildfire. He finished the season with the Wildfire, then signed with the Western Mass Pioneers on December 15, 1998. In 1999, the Pioneers won the USL D-3 Pro League championship as Jachym scored the game winning goal. After having athroscopic knee surgery during the pre-season, Jachym played limited time in 2000. He retired at the end of the season to devote himself to coaching. In July 2001, he returned to the Pioneers. In 2003, Jachym led the USL Pro Select League in scoring and was named both as League MVP and First Team All League. He retired at the end of the 2004 season. In addition to playing professionally, Jachym spent several years as an assistant with the Wethersfield High School boys' soccer team. In 2000, he became Wethersfield's head coach and took the team to four state championships over nine seasons.